The One with the CARDS March Designer of the Month Feature! Maggie - email me at paigetaylorevans at gmail dot com and I'll send you a copy of the book! I just got mine in the mail, finished the book I was reading last night (The Longest Ride by Nicholas Sparks), and can't wait to get started! 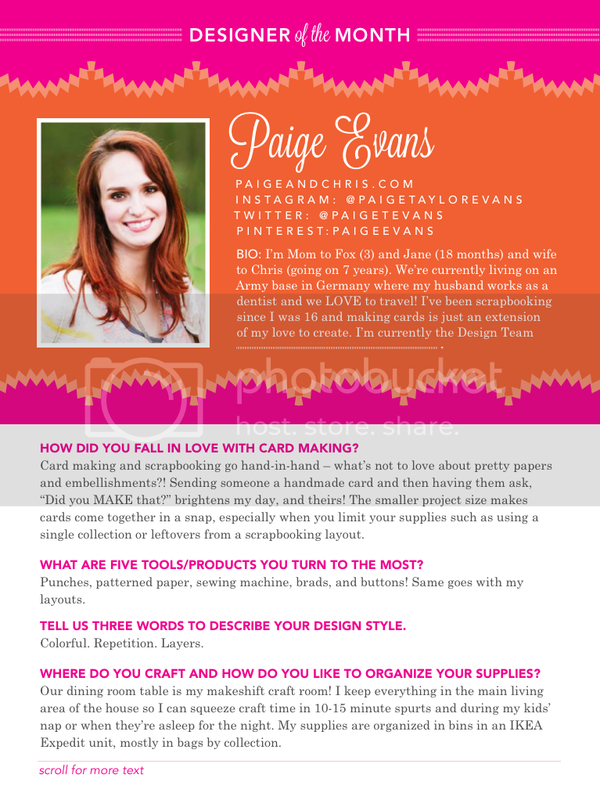 Tammy asked if I'd like to be the Designer of the Month in the March 2014 issue of CARDS Magazine. Ummmmm... YES! How to: Punch flower confetti from the patterned papers then cluster the flowers on the center of a pink polka dot paper card base. Place a pair of dimensional flower stickers on the center, tuck a hairpin under the right edge, and add a teal ribbon bow as shown. Drop pink spray mist over the top left and bottom right corners. Add a gold label sticker on the right edge, trim the excess, and place a sentiment sticker on top. 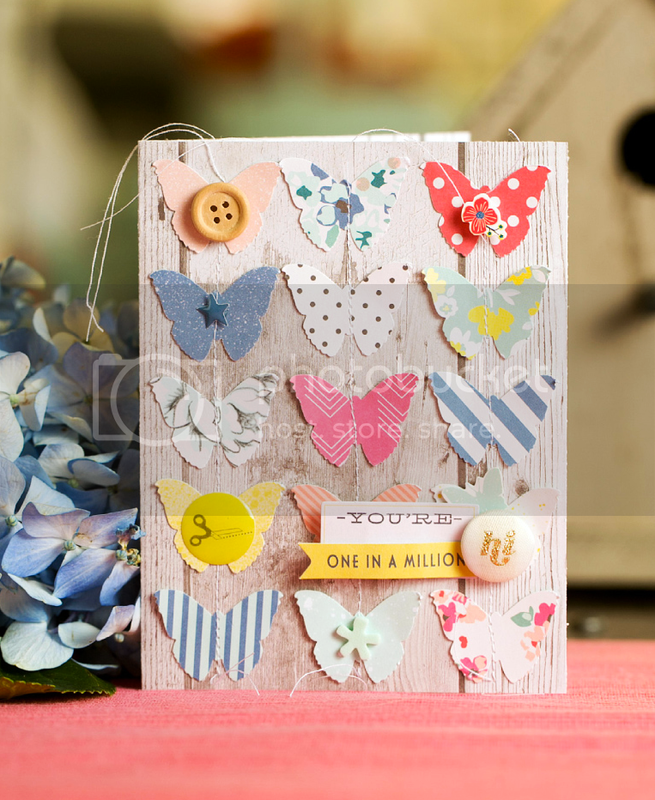 How to: Punch butterflies from patterned papers then adhere them in rows down a woodgrain paper card base. Sew down the columns of butterflies and bend up the wings. Top some of the butterflies with embellishments like a wood button, stickers, a fabric brad, and more as shown. Tuck a dimensional sentiment sticker under the left side of the fabric brad. 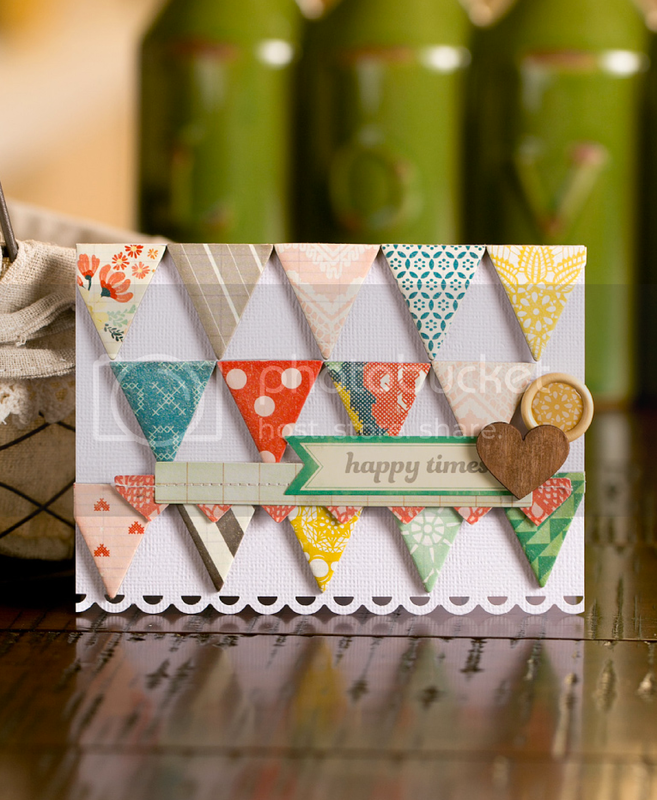 How to: Trim patterned paper strips with decorative scissors or a decorative border punch. 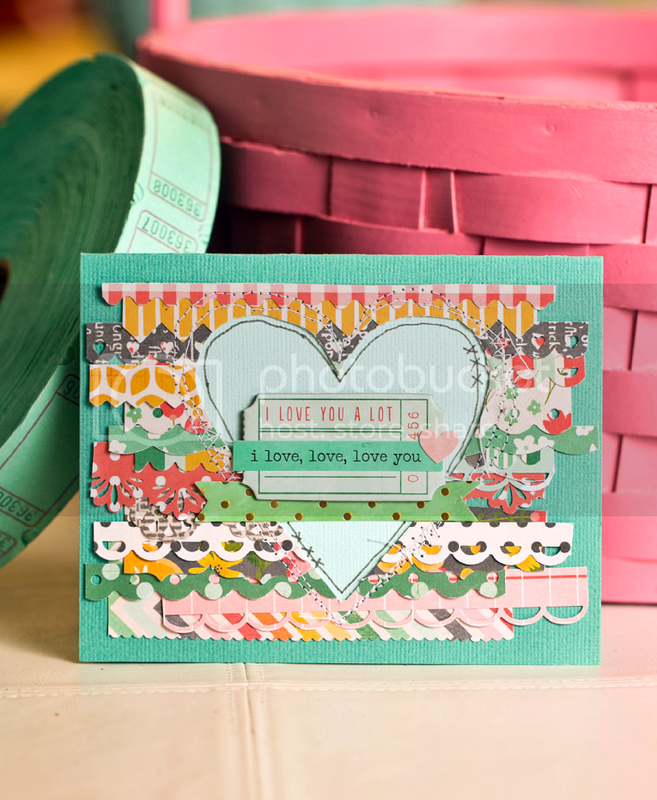 Layer the paper strips across an aqua card base. Cut a heart from the center of the card, back the shape with blue cardstock, then stitch around the heart a couple times using white thread. Bend up the paper strip edges to create dimension. Trace around the inside heart with a black pen. 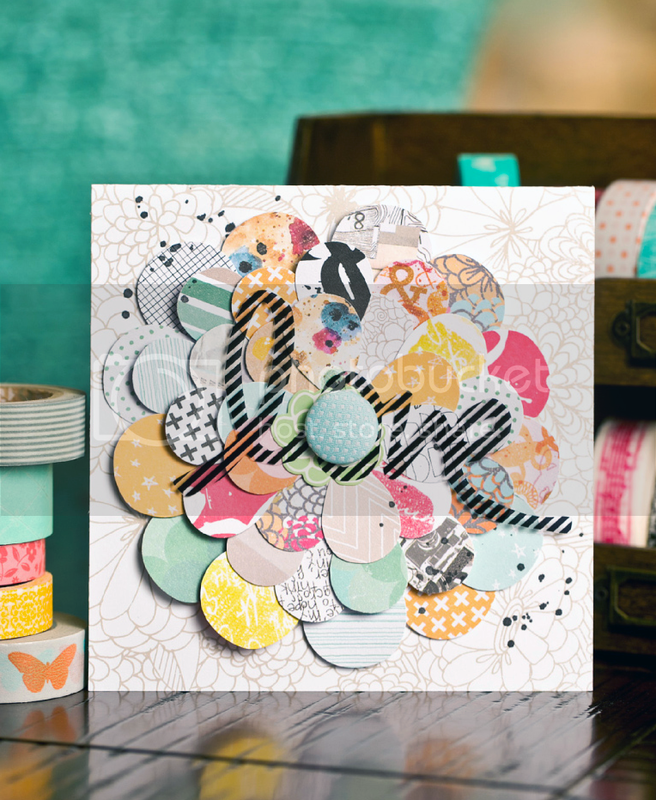 Layer a border sticker trimmed into a banner and a chipboard ticket topped with a sentiment and heart sticker to the card center. 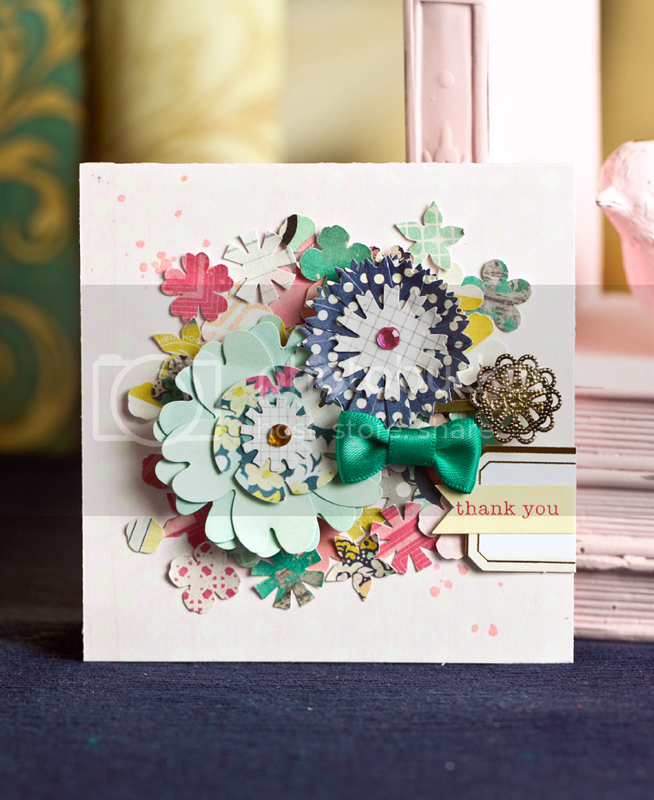 How to: Use a scalloped border punch to trim the bottom edge of a white card base. Place chipboard pennants across the front as shown. Add a stitched border topped with a sentiment sticker and a wood veneer heart along the bottom section of the card. Tuck a wooden button under the veneer heart to finish. How to: Punch petals from the Printshop collection of papers then adhere them in a flower design on the center of a floral paper card. Layer a flower sticker on the center followed by a word transparency with the “o” centered over the flower, then attach everything in place with a blue fabric brad set through the “o” and flower. Drop black spray mist over the top left and bottom right corners. Check out the entire article in the online issue of CARDS March 2014 - available on iPads, kindles, and lots of other electronic devices! Congrats on the Guest Spot!!! That's awesome! I loveeeeeeeeeee these!! LOVING them!!!! Always love your style! You inspire me to use my patterned paper! Stunning cards, i would expect nothing less from you and your incredible talent. Thank you so much for sharing your creations! Your blog is the first one I read in the morning. Congrats on the guest spot, Paige! All of your cards are gorgeous!! Wow! Your cards are really beautiful! Congrats on the feature, Paige!! I love love your lovely style! Thanks for sharing your inspiring work!